Walpole St Peter is merely a fenland village parish church, but its beauty has so stunned visitors that it has been called the Queen of the marshlands and cathedral of The Fens and many experts believe that it is one of the finest churches in England. It is impressive in its size and symmetry, unusually light and peaceful within, steeped in history and replete with rare and beautiful features. Since 1963 the church has hosted the annual Walpole St. Peter Flower Festival, whose enduring popularity makes it one of the most visited country churches in England. A church has been here at least since 1021 when the advowson (the right to make a living from the church) was given to the Abbey of Ely. Of that church, nothing above ground survives. The present tower was built in about 1300, but a sea flood in 1337 destroyed everything else of the existing church. Re-building might have started almost at once, but in 1348 the Black Death intervened. Nonetheless, the local landowners grew immensely rich thanks to the suitability of the land for rearing sheep, the proximity to ports such as Kings Lynn and close access to the market of East Anglia, at that time the most densely populated region of the UK. They showed their appreciation to The Lord by building a mighty church and embellishing it opulently. At first a smaller church was built around 1360 - the area which is now the chancel was added on to the east end of that church around 1425. The total was some fifty metres in length and stretched right up to the boundary of the consecrated land. Church processions were unable to pass by the east end of the church, so a passageway was created under the High Altar (known locally as the Bolt Hole) an extraordinary feature for a church of any age. The architectural style of the earlier section, which is now the nave, can be said to be Transitional Perpendicular, while the later section , which is now the chancel, is pure Perpendicular. The fact that the church was developed in only a few stages - starting with the old tower, then adding what is now the nave and finally the chancel - means that the completed effect is perfectly symmetrical, which is most pleasing to the eye and rather unusual. Many old churches have been added to in many stages and have lost their symmetry in the process. The 'new' chancel was probably added at the expense of the Rochford family, whose shield is over the southern entrance to the Bolt Hole, and some of whom are buried in the Lady Chapel, where the matrices of their brasses(but not the brasses themselves) can be seen. They were constables of Wisbech Castle. The south porch is the latest addition to the building - probably about 1450. Some restoration work took place in the early twentieth century. The advowson passed in 1109 to the Bishop of Ely, and was acquired for the Crown by Elizabeth 1 in 1561. The church has had its share of colourful Rectors. John Cross Morphew (appointed 1800) committed suicide in the Fleet Prison, reputedly because he has a nagging wife! Arthur Moore was appointed the first resident Rector (Meaning the Rector for this church only) in 1839. He was a skilled maker of stained glass windows. There are three of his windows in Ely Cathedral. He died in 1852. and there is a stone dedicated to him in the chancel. Henry Staveley was on the staff at Sandringham. His father and grandfather were Generals. It is said he raised his head too high when contemplating matrimony, so was exiled to Walpole St. Peter where he did sterling work. He rearranged the church, banishing the box pews to the rear of the church, altered the steps to the high altar, and bought the parish hall. One of the church's many claims to fame is that it was a star of a famous detective novel and television series. One of Dorothy L. Sayers' Lord Peter Wimsey novels was the Nine Tailors first published in 1934. A body is found in the bell tower of the parish church of Fenchurch St. Paul, and Wimsey eventually solves the mystery. The church is thought to be Walpole St. Peter, with some features of other local churches mixed in - indeed a drawing of the church in the book is decidedly familiar, although its tower is taller. In 1974, the BBC adapted the novel as a mini-series starring Ian Carmichael, and much of the filming took place in Walpole St. Peter Church. Local people still remember the filming, and one story goes that a cow was to brought through the dark Bolt Hole. She refused to be led by the appointed actor, so a local man had to lead her through! 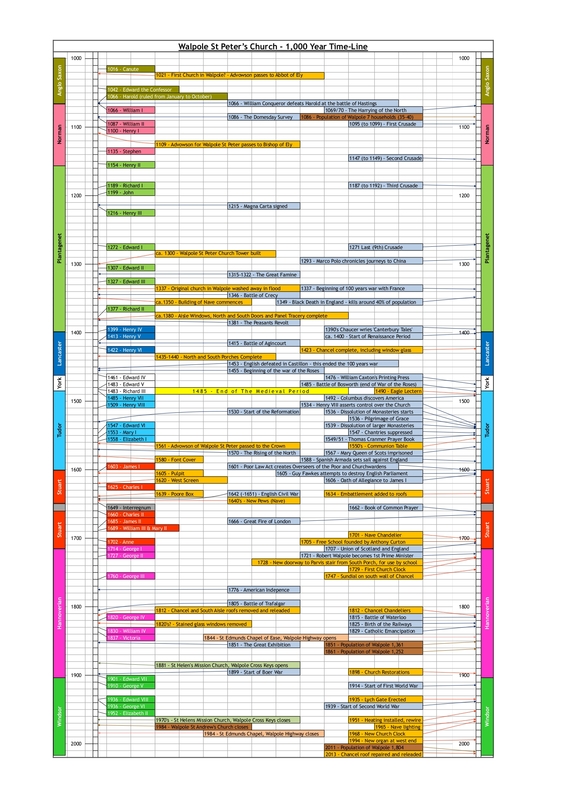 Over the last couple of years dedicated members of the Parish team have been working on the timeline shown here. This shows important dates and events in the church's history alongside historical dates and events from the wider society. We hope you enjoy looking at this and find it useful and informative.